The Caldera Kiln by Paragon is built to last. Ideal for classrooms, studios, and more, the Caldera is portable, stackable, and surprisingly affordable. Make jewelry from silver, bronze, and copper clays. Fire ceramics, porcelain, or stoneware jewelry — or even china, decals, enameling, and glass. Sag, slump, and fuse. Make small bowls, pendants, earrings, cufflinks, and bracelets. Enjoy the glittering beauty of dichroic glass. Glass compatibility and glaze color tests are fast and easy with the Caldera, which fires rapidly to 2350°F (1287°C). The Caldera's elements are coiled from the finest high-temperature wire available. They use heat-dissipating element connectors refined and proven over many years in Paragon kilns. The thermocouple, which senses temperature in the kiln, is protected with a high-nickel stainless steel sheath for long life. Made to exacting standards, the Caldera features 2½" (6.4 cm) insulating refractory firebricks, and dropped, recessed brick grooves that protect the element for long life. To strengthen the firing chamber, the firebrick corners are fitted together with L-shaped notches. This type of joint lasts longer than the butted joint and the "picture frame" mitered joint found on competitive brands. The vented switchbox has heavy-duty wiring for years of reliable service, and is coated with a durable, high-temperature, waterbased finish. A heavy-duty steel stand with mar-proof rubber feet is a standard feature. Used as a test kiln, the Caldera is relatively inexpensive, allowing students to make gifts in time for birthdays or holidays instead of waiting until a large kiln is fired. Used this way, the Caldera creates enthusiasm for a clay program because students can test glazes as they go instead of waiting for their projects to be fired in a larger kiln. 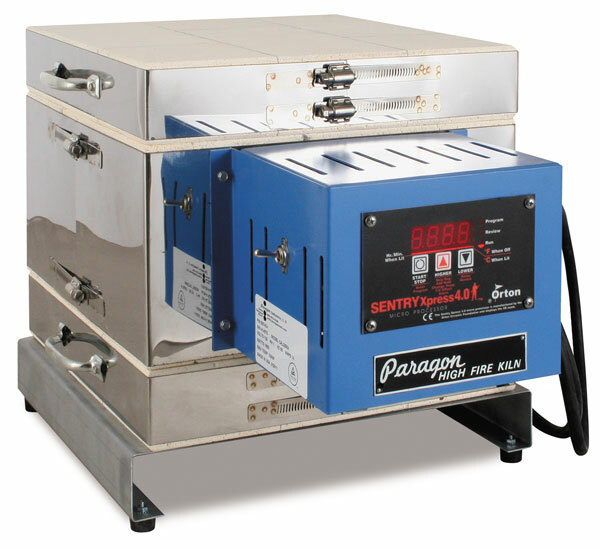 Included with the Paragon Caldera Kiln is the Sentry Xpress Digital Controller, which fires in either Ramp-Hold or Cone-Fire mode. Heating and cooling are controlled with simple 3-key operation. An on/off toggle switch allows users to turn the power off to the controller when the kiln is idle. 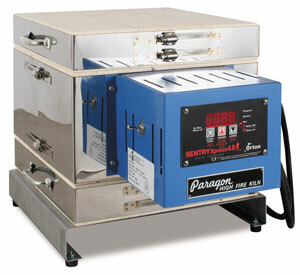 The Paragon Caldera Kiln is made in the USA.